It’s looking likely the Criminal Minds: Beyond Borders TV show will be renewed for second season by CBS. Deadline reports the network has given the series permission to begin making what are termed “if/come” deals to secure its writers for a second season. Criminal Minds: Beyond Borders features a specialized international FBI division that rescues Americans who get into dangerous situations, abroad. 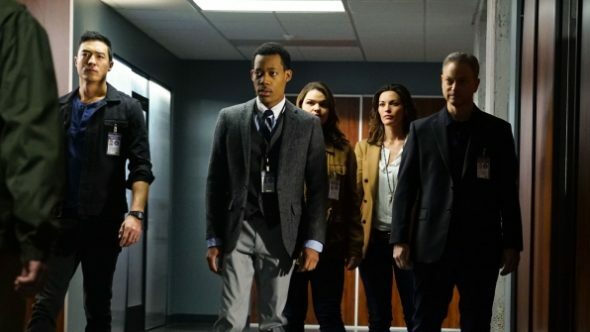 The Criminal Minds: Beyond Borders TV series cast includes: Gary Sinise, Alana De La Garza, Daniel Henney, Annie Funke, and Tyler James Williams. What do you think? Are you a Criminal Minds: Beyond Borders fan? Do you think CBS should cancel or renew it, for a second season? Great Show with a fantastic cast PLEASE RENEW!!!!! Yes they should absolutely renew Crime Minds Beyond Borders. It’s one of my favorite actors, Gary Sinise, at his best. Criminal Minds Beyond Borders should be renewed. The show provided important information regarding individuals traveling different countries. The show fits in with what is happening today in the REAL WORLD when people are murdered, stolen, etc. and things individuals should be more aware of their surroundings and watch people who act suspicious or seems unusually very helpful. Great show, great actors. Very educational in respect to the stories of what could happen beyond our borders. Keep it. The facts around the world make it educational and the story line is always intriguing and suspenseful. Don’t need the gore but will take it to keep the show. Please don’t cancel. Thank goodness! Great Show with great cast and phenomenonal writing!! It Should be cancelled! Its a horrible show! I agree with Pow. I like Gary Sinese better than any actor on TV but he should have left this show alone.His character doesn’t even have a credible reason to be on it. all in all as Pow says,”it is a horrible show.” I’ve never had as much difficulty watching as show as I have had watching this one.